Fremont has been a community long before the first settlers arrived in the area. It was home to multiple Native American clans from the Erie to the Wyandot. Most recently it was the Wyandot village of Junquindundeh. The Scioto-Sandusky trail that stretched from the Ohio River to Lake Erie ran through here. Fremont has almost always been a strategic point in the development of the area. Long before Europeans arrived in Ohio, there was a great conflict between large groups of Native Americans that were roughly divided by a geographic line drawn along the Sandusky River. At Fremont there were two 2 villages, one on each side of the river and these were both known as neutral locations, meaning that even warring tribes could come and go in peace without fear. In conjunction with the Native Americans that lived here, it was also at one time a French fortification, a British fortification, and lastly an American fortification. When Native Americans captured Americans in Kentucky and southern Ohio, they were often brought through here on their way to Detroit where they would be sold or traded among the various tribes that visited the area. Such notables as Daniel Boone and Simon Kenton were among the 100s of white prisoners that were brought here. 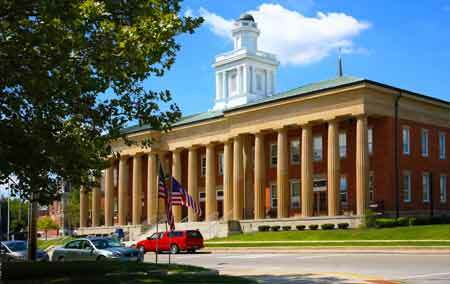 Fremont is perhaps best known as being the home of President Rutherford B. Hayes, which now includes his presidential library, Fremont is the county seat of Sandusky County. After the War of 1812, most of the Native Americans inhabiting the area had been forced out and in 1816 a small settlement had been established on the east side of the Sandusky River called Croghansville in honor of George Crogan (left) who successfully defended Fort Stephenson against overwhelming odds. 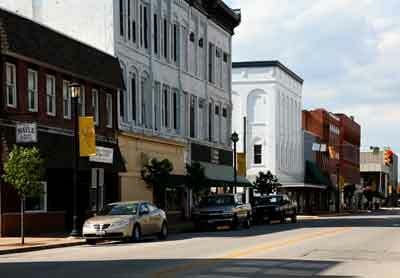 A year later on the western side the village of Lower Sandusky was established. A few years later the 2 communities merged and was known as just Lower Sandusky. As the young Ohio state began to get organized, the bureaucrats realized there were a number of towns in Ohio associated with Sandusky. With the introduction of the canals and widespread mail delivery the similarity in names began to create problems. In 1849 it was decided an official name change was needed for Lower Sandusky, but what name that hadn't already been used, would work best here? The answer would be found in current events of the day and political influence. Some citizens wanted the name Croghan to be re-established. Some objected because they claimed that Croghan was a difficult name to pronounce and spell. 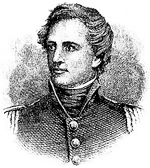 For those readers not familiar with the history of Fremont and the War of 1812, the name Croghan has particular significance to the area despite the fact that Crogan was a Kentuckian. During the War of 1812, there was a supply fort located along the Sandusky River called Fort Stephenson. It was never meant to be used as a major defensive work on the scale of Fort Meigs. In fact, General Harrison had ordered the abandonment of the fort and have it destroyed before it could fall into enemy control. But before those orders could be carried out, Croghan and his small force of 160 men engaged a superior enemy force of 700 British soldiers and Native Americans led by Techumseh, and decisively defeated them. So Croghan was a genuine war hero and much admired in the community for his grit and bravery. The problem was that there was a good bit of confusion on the pronunciation of the major's name. The last thing the community wanted was to add to the confusion they were already facing. It was then that Sardis Birchard and his nephew Rutherford Birchard Hayes floated the idea of re-naming the town Fremont. Fremont was a name that had been in the news of the day for several reasons that revolved around California. Birchard (who was a leading businessman in the community) along with Hayes (who would later become Ohio's governor and then the 19th President of the United States) strongly pushed for the name Fremont to be adopted. John Fremont had shown to be a leader, an explorer, and an outspoken innovator. He would later be the first presidential candidate of the new Republican political party. The fact that Rutherford B. Hayes was also a leader in the new Republican Party may have also played a part in their decision to support this particular name change. So in 1849 the name Fremont was officially made for the small town in northwest Ohio. John C. Fremont had been responsible for leading a force of 300 Americans against a Mexican garrison at Santa Barbara and later capturing the town of Los Angeles during the Mexican-American War in 1847. Fremont would later become one of the first senators of California in 1856. But perhaps more newsworthy in 1849 was the fact that gold had been discovered in California. 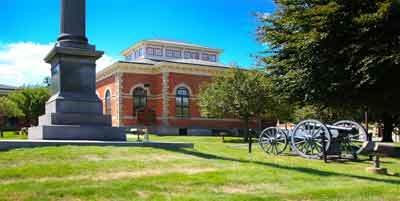 Today, Fremont is known as a historic community. It is known as the home of the Rutherford B. Hayes Presidential Center. Downtown Fremont offers a variety of activities throughout the year including a Farmer's Market on Saturday's where visitors can purchase homemade and fresh products from local growers. In the downtown area is the Birchard Public Library that was founded in 1870 by Sardis Birchard. The building stands on a park where Fort Stephenson was located and is where George Croghan is buried next to his faithful cannon "Old Betsy". A term familiar with many, but most aren't aware of its origin. Usually "old Betsy" was used from some reliable piece of equipment. No one can be sure when the term first appeared, but we do know that George Croghan referred to his single 6 pound cannon at Fort Stephenson as "Betsy". In 1813, Fort Stephenson was ordered abandoned by General William Harrison who was in charge of American forces on the western frontier. Fort Stephenson was in a precarious position, poorly outfitted and directly in the path of 700 well-trained British troops and a force of Native Americans led by Chief Techumseh there was little hope the fort could be successfully defended. The British had already been repelled after attacking Fort Meigs located further west. Instead of trying another assault there, they decided to by pass Fort Meigs by going around it. It was during this that they encountered Fort Stephenson and Major George Croghan. Harrison had sent orders to Croghan to destroy and abandon the fort. But Croghan sent word back: "Message received too late. We mean to hold out." With that decision, Croghan ordered his men to limber up "Betsy" the only cannon in the fort, and in his words "make 'em think Betsy's a hundred cannons" by firing and repositioning the single cannon. "Fill her with all the powder she'll hold and anything else you can lay your hands on!" Croghan shouted. During the assault that followed 150 of the British were killed, while Croghan only lost 1 man and 7 wounded. The British retreated back to Canada and Croghan was awarded the Gold Medal for his gallantry. 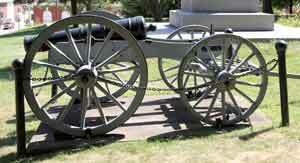 The cannon named "Betsy" proved to be a reliable defender of the fort. Later in time, Davy Crocket named his rifle "Old Betsey" perhaps in honor of Croghan's reliable artillery piece. Many years later Croghan died in New Orleans. In 1906 his body was re-interred to Fremont and lies beneath a tall monument looking out toward the river. Guarding over him is his cannon "old Betsy".